Advertising has always been one of ThoughtOffice’s favorite playgrounds… and one of the greatest places to stretch the creative mind. Great advertising relies on associations to create some reaction in your core audience. And the Expert Advertiser Module is the catalyst for well over 10,985,690 (you read that right, over TEN MILLION, NINE HUNDRED EIGHTY-FIVE THOUSAND) associations available from right within our IdeaBrowser Search Engine. 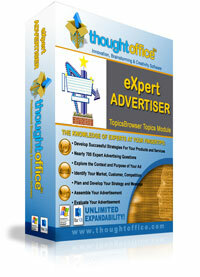 ThoughtOffice Expert Advertiser contains the concentrated expertise of successful ad execs, MBAs, CEOs, and other domain experts, and puts their skills at your fingertips. 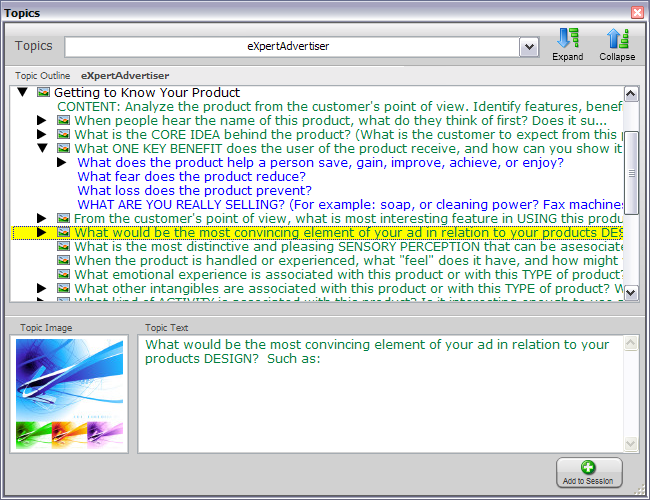 Their expertise will guide you to advertising success, with just a few clicks of your mouse. Whether you need to reposition a service, drive a new product to market, or find a way to stop trade show traffic dead in their tracks, ThoughtOffice is the solution. Now you can have the edge you need, 24/7, and a brainstorming team that never filters a potentially killer idea just because of some big ego.